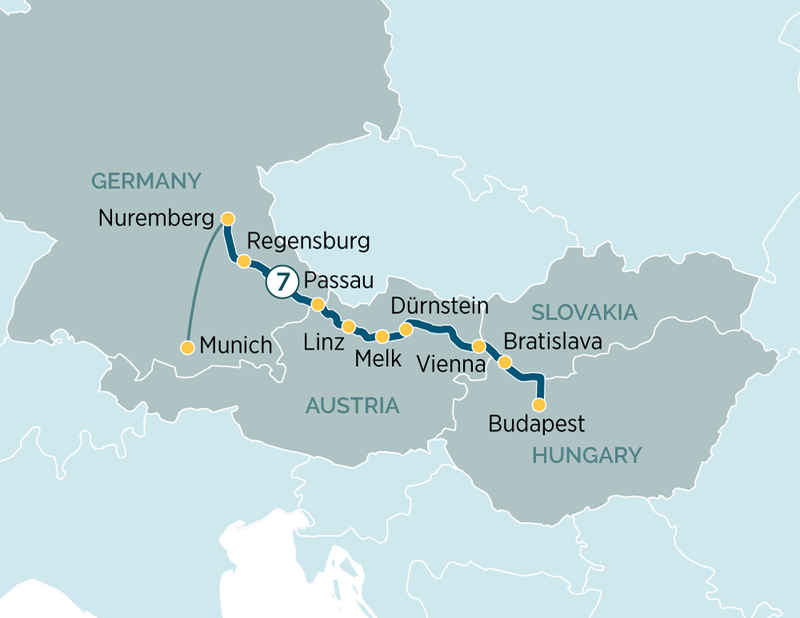 Travel from the vibrant city of Budapest in eastern Europe to the heart of Bavaria on the Danube River. Our 8-day Danube Delights river cruise introduces three capital cities, a string of charming heritage towns, and a wealth of natural beauty – for an unforgettable European adventure. Budapest is the liveliest and most beautiful city in Eastern Europe. Your day begins with a guided tour of the city’s main heritage highlights, including the majestic Hungarian Parliament Building. Those feeling active can hike to the summit of Buda Hill, and enjoy stunning views of the city. From one capital to another; welcome to Bratislava, the largest city in Slovakia. Offering a blend of architectural styles – from Roman to Celtic – Bratislava is a pleasure to explore on foot, with Mirbach Palace and the Gothic St Martin cathedral providing an architectural showcase. Emerald Waterways guests are invited to enjoy home-hosted coffee and cake with a Slovakian family – for an authentic slice of local life. Austria provides countless opportunities for cultural immersion, both in the elegant capital of Vienna and the stunning heritage cities of Melk and Passau. EmeraldACTIVE excursions allow you to hike to the battlements of Durnstein Castle, or enjoy an unforgettable cycling tour on the banks of the river. Return economy flights from one of up to 15 UK regional airports are included in the price of your holiday. Please call us to check if we can offer your local airport. After breakfast, we arrive in magnificent Regensburg. On our guided walking tour, you will have the chance to see one of the oldest bridges crossing the Danube and see the city’s architectural highlights including the Old Town Hall. Your flight home is included in the price of your holiday. Please call us to check if we can offer your preferred airport.